A simple and minimalist solution is this Nordstrom Sunglass Rack Plug-In Nose Piece. While simple in design and execution It is nevertheless quite elegant and contemporary in theme. A staging area at the front creates a natural Front Productstop to keep sunglasses in place and equally faced. Step through the gallery of images to consider from various distances. 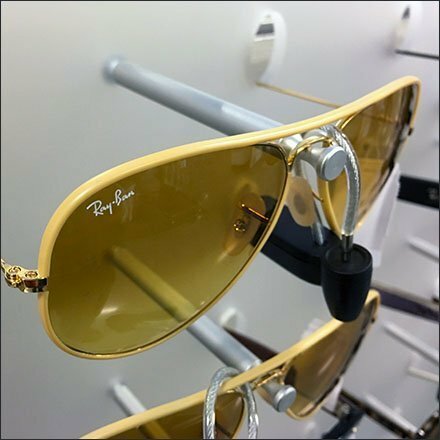 Though stocked with Ray-Ban the overall display was not signed or branded itself. Seen at Nordstrom. BACKSTORY: Sunglasses or sun glasses are a form of protective eyewear designed primarily to prevent bright sunlight and high-energy visible light from damaging or discomforting the eyes. They can sometimes also function as a visual aid, as variously termed spectacles or glasses exist, featuring lenses that are colored, polarized or darkened. In the early 20th century, they were also known as sun cheaters (cheaters being an American slang term for glasses).